This trip will take you through many amazing landscapes of the far Northeast of Vietnam. Especially, you have chance to discover Lung Phin or Meo Vac Market which is unique and indispensable cultural feature in Dong Van, Meo Vac or Sa Phin. Market here not only is the place to exchange the goods and service consumption demand, but more importantly, it is clearly expresses the cultural identity of ethnic community. After having breakfast at your hotel, you will have morning transfer 4 hours from Hanoi to Thai Nguyen and up hill to Bac Can. Lunch will be served in Bac Can and then transfer a bit more to Phu Thong where we start cycling off road 54km to Ba Be National Park, home to Tay and Thai minority people. Tonight, you stay overnight at the local house of Tay minority. After having breakfast, we will enjoy a short ride to the boat pier and boarding a local motor bat for morning cruise to explore Ba Be Lake, the largest natural lake in mountainous region of Vietnam which is surrounded by walled-up limestone mountain covered by thick rain forest. We will visit Puong Cave, Dau Dang Village amd Waterfall before making a cut through Na Hang Reservation to Da Vi junction. Leave the boat and take a short ride to a local restaurant for our lunch. Continuing to ride 50 km mostly uphill to Bao Lam District, this portion of the road sneaks on the high mountain side offering marvelous scenery of the river, stream and valleys below. Enjoy some stops along the way to visit tribal villages of the Tay and Dzao along the way. Tonight, you stay overnight at the hotel on the bank of the Gam River. Today you will enjoy a full day biking through the beautiful region along the mighty Gam River. Breakfast and start biking from your hotel. Following national road 34A for the whole morning on old tarmac which runs in parallel with Gam River eastwards for 51km via old Bac Me and Bao Lam town let. Paying visiting to villages of the Nung people along the way. This portion of the road is fairly good just with some low mountain passing over. Turn left at Ly Bon, cross the Gam River by newly built bridge to the northern bank and then having picnic lunch break.Afternoon cycle is challenging uphill towards Meo Vac town let near the Chinese border. The road winds its way on steep mountain sides for 55km, You may cycle as far as you can and then supporting vehicle will transfer the last portion of the road to Meo Vac.Arriving to hotel at about 16.30. Check in and free to explore the town. Today you will enjoy the most spectacular mountain scenery of Vietnam. Breakfast and then spend 2 hours in the morning to visit Meo Vac Market. Option: If on the date of the Tiger or Monkey, morning will be for paying visit to Lung Phin Market, which located in a remote commune 17km from Meo Vac.Then challenging up steep mountain pass of Ma Pi Leng 28km to Dong Van Town let.Check in hotel and relax for the rest of the day or walking 2 hours to explore the valley near by. Leave Dong Van at 08,30 and follow road 4C, getting though valleys after valley to Xa Phin valley. Stop for paying visit the former Palace of the Hmong King who ruled over the Hmong community and control opium trading until 1945.Continue biking along the same road 21km to Sung La valley and then up steep mountain to Pho Bang ancient trading town, enjoy several stops along the way for sightseeing and paying visiting Sung Muoi village of the Hmong. Lunch break in Pho Bang.Continue cycling downhill from Pho Bang to Yen Minh via Pho Cao Mountain pass which offers stunning scenery of yen Minh valley.Arriving at the Thao Nguyen hotel in mid afternoon. Check in and relax. Breakfast, check out hotel and get ready for great challenging today. We shall conquer two high mountain pass: Yen Minh and Quan Ba.Depart at 08.30 with biking 2 km flat road from hotel and then challenging 19km uphill to the top of Yen Minh pass. The road is steep with many sharp bends but offers great view of marvellous valley below. Enjoy a tea beak at the top before getting downhill 18km to Can Ty commune and then cycle through the valley along the Nho Que River for 6km. Take another break for recharging energy before biking uphill 13km to Quan Ba town let. Paying visit to Nam Dam village of the Zao people before lunch break.Afternoon challenge is conquering Quan Ba Pass, The 8km uphill to the Haven Gate at the top is really steep with many sharp bends. Then getting down steep mountain 20km to the bottom of the valley. Picked up in mid afternoon for 25km transfer to Ha Giang. Check in hotel and free to explore this charming city. The cycle today is easy. Leave Ha Giang at 08.00 and cycle 3 km to Ban Me village of the Tay. Cycle around the valley, stop to pay visiting to homes of the Tay people. Then continuing along national road 2 on good tarmac 45km to Tan Quang junction. Transfer up steep mountain pass 17km to the top of Hoang Su Phi pass, enjoy picnic lunch at the top.Continue cycling along a narrow country road 16km to the Panhou ecolodge. 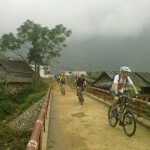 Check in and relax or take an hour cycle to explore the Giang village near by. Transfer 48km from Panhou to Bac Quang town let. Biking from here along the road 279 through the low land of Ha Giang with a mountain pass to the area of Lao Cai province. Spending an hour to visit a village of the Pa Then ethnic as well as exploring Nghia Do valley.Arriving to Pho Rang town let in mid afternoon, stop biking here before late lunch.Take the road transfer 68km to Bac Ha.Check in hotel and relax. Day10: Bac Ha – Sunday Market. Today we have free holsall day explore market. In the morning we start cycling in the surrounding area and visit a number of fairly traditional predominantly. Overnight in Sapa. Day12: Optional ride to top of Tram Ton pass, the highest pass in Vietnam. Today we have leisure explore Sapa by own until all group start cycle down to Lao Cai where we board the overnight train at 1930 to Hanoi. Pack essentials, including light comfortable clothes suitable for outdoor activities, and small day pack. It is essential to bring your passport on this trip. We also recommend packing: personal articles, insect repellent, sun cream, raincoat, sun hat, torch..